Flynn escalates his agenda by landing in 1931 Chicago to call in a favor from infamous gangster Al Capone. The reunited trio are hot on Flynn's train and enlist the help of lawman Eliot Ness. Den of Geek review - As the Rittenhouse noose tightens, the protagonists must navigate a contrived historical framework to continue their mission. I was so excited when I saw Misha Collins' name in the opening credits - first Bobby, now Castiel? 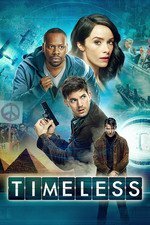 If Timeless gets picked up for another season, I hope they keep the Supernatural cameos coming. On the one hand I like the gleeful abandon with which they seem to have abandoned the reverence for The TimelineTM. On the other I wonder how they are going to resolve this in a way that makes it possible for us to be watching it from this timeline where we live, and I just hope it's not going to be as stupid as The Flash time travel, which put me off of that whole series. The obsession with "get my sister back" vs the very integrity entire rest of the world is just annoying, well unless Lucy evolves into a well intentioned but viscous villain that is the founder of Rittenhouse. Every now and then, a show comes along that is so ridiculous — so expansively silly — that it goes around the bend from meaningless to meaningful, from a blank canvas to one whose emptiness signifies something profound. One thing I have noticed is that for the last few episodes they've stopped even telling us just what changed. They are trusting us to just kind of get that by now; history seems to be at least partly self-healing, so that the changes like Lucy's sister getting erased end up being fissures, not expanding waves that propagate throughout all of reality. It's strongly hinted that Capone's brother will end up taking up Elliot Ness's role in history, but they don't spend the screen time explaining that; they've got actual plot to show us. And on reflection, the shift which is foreshadowed in the preview of Lucy telling Flynn she's there to help, not try to stop him, may come from a recognition of this. The danger to the TimelineTM may not be as great as we tend to think, but the danger to individuals might be very great. And the importance of individuals might be much greater than the importance of the integrity of the Timeline. I loved Jiya in this and hope she gets to try out travel someday. And Rufus to Al Capone: "I'm likeable." Yes, Rufus, you are! For me, this is the best episode the show's done. From the first minutes with the priest and his Fantasy Football fancy, I felt like I was watching a different show. I haven't seen the writers add spice this effortlessly yet. Exposition was handled more skillfully than I've seen so far too. Whether it's got something to do with Matt Whitney and Anslem Richardson working as a team, or if the whole staff has suddenly slammed into hitting their stride, this was a hit and I want to see it keep going. I even enjoyed Wyatt this time, and that is very new for me. I hope they can keep this director coming back, too. He knew how to take the right amount of time with a scene and helped get some really great moments out of the whole cast here, where usually (to my eyes) it's been mostly Abigail who keeps hitting her beats week after week. If someone else wants to post tonight's season finale thread, please go ahead, I won't get the chance to watch it until Wednesday.